Listen with audio only on our site, download the audio, or listen to the audio with our YouTube video. The shocking, and sensational conclusion of the Adventures of June Bug. 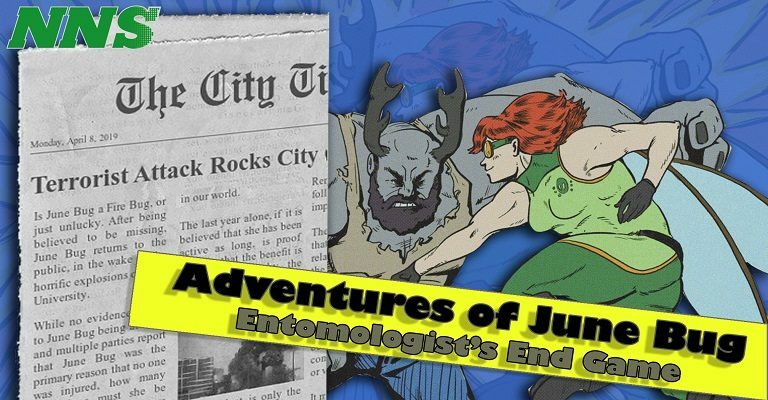 Can June Bug defeat the Entomologist and Stag Beetle. Is HellSting there to help, or hurt his prior ally. Will June Bug make it out of this mess? An action packed audio drama series set in a world similar to ours, The Adventures of June Bug is an original story that combines the ever prevailing super hero genre with the passion and power of a struggling young adult as she tries to make the best choices for her city, and the people she cares about. As she enters upon her journey to be a super hero, she stumbles and deals with real life problems mixed in with the bizarre. Can she overcome the largest psychological challenge of her life, and keep her positive mentality? “The Adventures of June Bug” stars Katie Seuthe-Ruiz, Drew Kyle, Lisa Masi, and Michael Wayne Beck. “Monster footsteps on wood” was created by “Suburbanwizard” and is licensed under Attribution License. “metal_pan_crashes.aiff ” was created by “nothayama” and is licensed under Attribution License. “Cartoon_Punch_01.wav” was created by “RSilveira_88″ and is licensed under Attribution License. “crash.wav” was created by “Sparrer” and is licensed under Attribution License. “Crash” was created by “bone666138” and is licensed under Attribution License. “Opening and Shutting Doors » Door opening and closing 2” was created by “JakLocke” and is licensed under Attribution License. “Setting Down Cup” was created by “Nightflame” and is licensed under Attribution License. “Impacts » heavy impact 1.wav” was created by “aropson” and is licensed under Attribution License. “New Foley Sounds- by Allan K Zepeda » Rocks Falling No-Reverb Edition 16 Bit. Foley Sound” was created by “ALLANZ10D” and is licensed under Attribution License.